UP tv‘s newest holiday movie “Marry US For Christmas” is cute. I didn’t see the first movie “Marry Me For Christmas”, so… I was confused at the beginning of the film. The characters were unfamiliar to me. Over the course of the movie, I was able to understand and become more acquainted with the story. 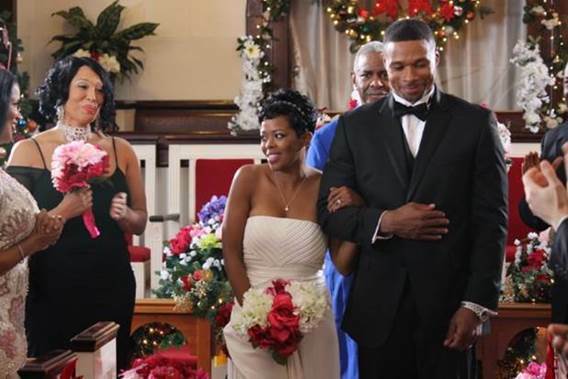 Young professionals Marci Jewel (Malinda Williams) and Blair Kirkland (Karon Riley) are longtime sweethearts who are finally ready to tie the knot. They decide on impulse via a Skype date that they should marry on Christmas Eve, rather than wait until June. The pair secretly try to secure their future finances without consulting each other on the possibly unsavory career moves. Marci’s mom Stephanie Chandler Jewel (Victoria Rowell) has a secret of her own with her new beau Antonio Simpson (Marques Houston). Their May-December romance leads to an engagement no one in the family expected. The entire movie centered around dating, preparing for Marci and Blair’s wedding and family bonding. 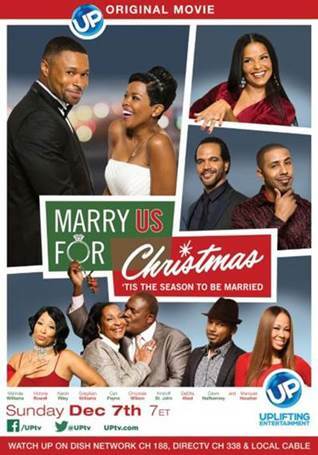 Actors Greg Alan Williams , Carl Payne, Chrystale Wilson, Kristoff St. John and DeEtta West also star in this romantic holiday treat. Tune in tomorrow if you you are looking for a clean Christmas romance film to enjoy. This entry was posted in Entertainment, Movies, Reviews and tagged Karon Riley, Malinda Williams, Marques Houston, Marry US For Christmas, Victoria Rowell. Bookmark the permalink.